The Dominican Sisters at Sacred Heart have served Lincoln Heights for over 120 years, creating bright futures for generations of Angelenos. Los Angeles Councilman Ed P. Reyes supports Sacred Heart because this school unlocked the leader in him. 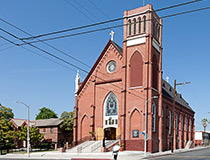 The Sacred Heart Parish is a thriving faith community in Lincoln Heights with many diverse and thriving ministries. We invite you to visit the Sacred Heart Parish website.